At much the same time that Colonel Swinton was first pleading his case to the War Office for armoured fighting vehicles, the same pattern of events was emerging in France. 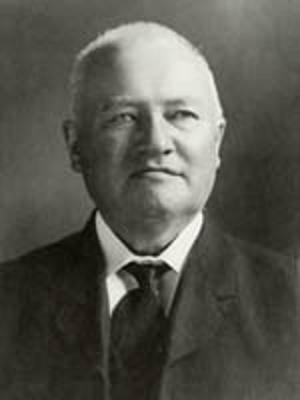 Here Colonel J. E. Estienne had also seen the cross-country capability of the Holt tractor and, working from this conceptual basis, advocated the development of what he called a cuirassé terrestre (land battleship) to unlock the static nature of trench warfare. Estienne’s ideas found a ready acceptance in the mind of General Joseph Joffre, the French field commander, who saw great tactical utility for Estienne’s original concept for a 4000-kg (8,818-lb) armoured tractor with a crew of four and able to drag a 7000-kg (15,432-lb) armoured sled carrying 20 infantrymen. The similarity to Swinton’s original thinking is strong, and Estienne’s tactical notion was that such an armoured force could ‘sandwich’ the occupants of the desired trench by pushing half its strength across the trench to isolate it and keep it under machine-gun fire. While he saw the advantages of such a combination, Joffre was sufficiently astute to realise its technical impracticality. Ultimately the French army reached the same conclusions as the British about the need for a tracked armoured vehicle that could cross barbed-wire and knock out the German machine-gun posts, and so open the way for the attacking infantry. Joffre therefore ordered Estienne to Paris, there to liaise in the development of France’s first tank with Eugene Brillie of the Schneider-Creusot company. This was the French licensee of the American Holt company, which had supplied one 45-hp (33.6-kW) and one 75-hp (55.9-kW) machine for trials purposes in May 1915. The basic design made extensive use of Holt components and practices, and was completed towards the end of 1915: on 31 January 1916 an order was placed for 400 of these tanks, to be designated Char d’Assaut 1 (CA 1) Schneider and to be delivered by November 1916. August 1916 saw the creation of the Artillerie d’Assaut, as the French tank arm was named, and in September the first CA 1 Schneider tanks were delivered just before Estienne was appointed commander of the tank arm at the end of the month. The CA 1 Schneider was based on the Holt track system, which in this application was notable for the fact that it was sprung by vertical coil springs, but equally notable for its short overall length and very limited forward rise. The all-important trench-crossing and parapet-climbing capabilities were therefore an indifferent 1.75 and 0.8 m (5 ft 9 in and 2 ft 7 in) respectively, and ground clearance was also too small to give the tank useful performance under adverse conditions. The hull was basically rectangular, with a boat-hull nose section to aid parapet-climbing and reduce the tank’s chances of embedding its nose in mud, and terminated at its front in a large serrated wire cutter. At the rear were a pair of upward-curving projections designed to increase trench-crossing capability by increasing the tank’s effective length. The CA 1 Schneider was armoured to a maximum thickness of 11.5 mm (0.45 in). The vehicle massed 13500 kg (29,762 lb) under combat conditions, and was powered by a 55-hp (41-kW) Schneider petrol engine located at the front left of the vehicle (with the driver to its right), driving the tracks via a crash gearbox: steering was effected by clutches and brakes on the half shafts. As in the British Mk I, the petrol tank was located internally, to feed the engine by gravity. The CA 1 Schneider had a crew of six (an officer as commander/driver, an NCO as second-in-command, and four enlisted men in the form of a gunner, a loader and two machine-gunners), who entered and left the tank via large double doors in the rear. The armament was planned originally as one 37-mm gun and machine-guns, but the definitive fit comprised one short-barrel 75-mm (2.95-in) Schneider gun with 90 rounds and two 8-mm (0.315-in) Hotchkiss machine-guns with a total of 4,000 rounds. The gun was located in a narrow embrasure on the right towards the front of the vehicle, and this allowed traverse of only 60° and elevation in an arc between -10° and +30°, severely limiting the capabilities of this otherwise useful main armament. The machine-guns were located in substantial ball-and-socket mountings on the hull sides, each mounting allowing traverse of 106° and elevation in an arc between -45° and +20°. 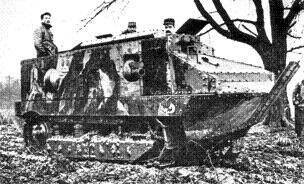 The CA 1 Schneider first saw action at Berry-au-Bac near the Chemin des Dames on 16 April 1917: of the 132 tanks committed no fewer than 57 were destroyed and many others damaged beyond economical repair. The primary culprit for this disaster was a combination of poor design and the Germans’ special ‘K’ bullet with its tungsten carbide core, which could penetrate the French armour without undue difficulty. The poor design concerned mainly the dismal ventilation and the location of the fuel tankage right next to the machine-guns, and after several tanks had blown up the CA 1 Schneider was dubbed the ‘mobile crematorium’, an epithet that was slow to disappear even after the internal tankage had been replaced by two armoured external tanks each holding 100 litres (22 Imp gal); ventilation was also improved, but remained problematical under certain conditions. Protection was enhanced by the addition over the most vulnerable areas of rudimentary spaced armour 5.5 mm (0.22 in) thick and located some 40 mm (1.57 in) from the base armour: this added about 500 kg (1,102 lb) to the tank’s combat weight. The CA 1 Schneider remained in service up to the Armistice of November 1918, but was neither popular nor successful. Developments were planned as the CA 2 (with the 75-mm/2.95-in embrasure gun replaced by a 47-mm gun in a rotating roof turret) and the CA 3 (with twin roof turrets in a longer hull and powered by a 100-hp/76-kW engine): the CA 2 attained prototype form, but the CA 3 did not reach even this stage. Later in the war the CA 1 Schneider found additional employment as a supply tank, the embrasure gun being removed and another door fitted in its place to create the Schneider Char de Ravitaillement. Development and production of the CA 1 Schneider had bypassed the French army’s normal vehicle procurement executive, the Service Technique Automobile, which was sufficiently piqued to instigate the design and construction of another battle tank. This was the Char d’Assaut Saint Chamond, designed by Colonel Rimailho and ordered from the Compagnie des Forges et Acieries de la Marine et Homecourt (FAMH) at Saint Chamond. The first prototype was completed in February 1916, and two months later the STA ordered 400 of the type. Like the CA 1 Schneider, the CA Saint Chamond was based on the Holt sprung tractor system, though in this application with the track length increased by about 0.3 m (11¾ in). This was clearly a basic improvement over the trackwork of the CA 1 Schneider, but was totally offset by the superimposition of an extraordinarily long hull, increasing overall length from the 6.32 m (20 ft 9 in) of the CA 1 to 8.69 m (28 ft 6 in): the result was cross-country performance still worse than that of the CA 1, with the tendency to ditch on only slightly undulating ground: in terms of performance in front-line conditions this translated into trench-crossing and parapet-climbing capabilities of only 2.4 and 0.38 m (7 ft 10 in and 1 ft 3 in) respectively. Two unusual features of the CA Saint Chamond were its provision for a rear driving position (the only time this has been featured in a tracked fighting vehicle) and its use of electric drive for the tracks. The Crochat-Collardeau electric generator was driven by a 90-hp (67.1-kW) Panhard petrol engine, and current was supplied to the electric motor attached to each track’s drive sprocket. Differential powering of the tracks provided considerable agility within the limitations imposed by the hull, and despite a combat weight of 22000 kg (48,501 lb) the CA Saint Chamond had useful performance including a maximum speed of 8 km/h (4.9 mph) but a range of only 60 km (37 miles). The primary disadvantage of the electric drive system was its weight, which added to the mobility problems engendered by the long hull. This was armoured to a maximum thickness of 11.5 mm (0.45 in), and terminated at its forward end in a well-sloped glacis plate above an angled-back V-shaped lower surface designed to help the tank ride over earth banks and the like. The CA Saint Chamond possessed a crew of eight including the driver and commander, who each had a small cupola at the front of the vehicle, and access to the vehicle was provided by a door in each side plus a third in the tail plate. The armament comprised one 75-mm (2.95-in) Saint Chamond TR commercial gun (first 165 vehicles) or one 75-mm (2.95-in) modèle 1897 gun (last 235 vehicles) with 106 rounds, and four 8-mm (0.315-mm) Hotchkiss machine-guns with a total of 7,488 rounds. The TR main gun was located in a limited-traverse mounting in the glacis plate, and the machine-guns were placed one in the bow (on the lower right-hand side), one in the tail plate, and one on each side of the hull. Deliveries of the CA Saint Chamond began late in 1916, and the type was first used in action on 5 May 1917 at Moule de Laffaux. In this first engagement the limitations of the design became all too apparent: of 16 CA Saint Chamond tanks committed, 15 ditched in the first line of German trenches. Further action confirmed the need for modification, successive efforts increasing the armour to a maximum thickness of 17 mm (0.67 in) against the effect of the ‘K’ anti-tank bullet, a raised forward section of the hull, the elimination of the commander’s cupola, the replacement of the original flat roof with a pitched roof so that grenades would roll off, and the use of wider tracks. 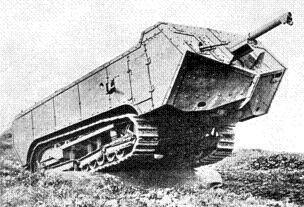 These improved the CA Saint Chamond’s capabilities, but nothing could be done about the basic design flaw in the vehicle’s configuration, and from May 1918, when the final deliveries were made, the type was increasingly stripped of its main gun and used for supply tasks as the Char Saint Chamond de Ravitaillement. Both the French chars d’assaut were perhaps ahead of their British contemporaries in gun calibre and the location of this single weapon in a central mounting, but the French designers had been too impressed with the cross-country capabilities of the Holt tractor to realize that a long track length combined with a large forward rise were essential to adequate trench performance. The two French tanks were thus little more than incidentals to the French army’s war effort, though they did play an important part in the development of ‘tank consciousness’ and in the evolution of tank tactics and organization. However, the most important French tank of World War I was an altogether different machine, the Renault FT light tank, the designation indicating Faible Tonnage (light weight). The concept stemmed from Estienne’s desire for a lightweight partner to his CA 1: the heavy tank would crush barbed wire and deal with the German strongpoints, and the lightweight machine would accompany the attacking infantry to suppress any surviving pockets of German resistance and develop the exploitation phase of any breakthrough. Estienne’s first choice as partner in the design and development of the CA 1 had been the company headed by Louis Renault, but Renault had declined Estienne’s invitation on the grounds that the company lacked any experience in heavy tracked vehicles and was, in any case, heavily committed to other efforts. However, by 1916 Renault had become involved in production of tracked vehicles (mainly tractors for the French artillery), and was more receptive when Estienne proposed a collaborative venture to produce the desired light tank. There remains some doubt as to the exact design parentage of the resulting FT, though Renault and a subordinate (Serre) were certainly involved, and it seems likely that Estienne exercised more than a watching brief over the project. Yet again Estienne bypassed the normal channels of procurement, and in October 1917 went straight to Joffre with his scheme for 1,000 examples of a 4000-kg (8,818-lb) light tank carrying one 8-mm (0.315-in) machine-gun or, in a small number, one 37-mm gun in a 360° traverse turret, possessing a maximum height of 1.75 m (5 ft 9 in), armoured against small arms fire and possessing a maximum speed of 12 km/h (7.5 mph). Estienne also proposed, in a very far-sighted manner, that a number of the machines should be completed with wireless equipment to allow communication between commanders and their mobile forces. Though there was considerable resistance from some parts of the French war ministry apparatus, Estienne’s notion found sufficient favour to secure authorization of prototype production after a mock-up had been completed at the end of 1916. The first prototypes appeared in February and March 1917, and immediately displayed excellent qualities in trials at the Champlieu camp. An initial order for 150 FT tanks was placed on 22 February 1917, but at the insistence of General Henri Pétain, the French commander-in-chief, the total was upped to 3,500 vehicles for delivery by the end of 1918, and additional orders then increased the planned production run to more than double this figure. It was clear that Renault could not handle the orders on its own, and this important programme soon involved Belleville, Berliet, Delaunay, Renault and SOMUA (Société d’Outillage Mécanique et d’Usinage d’Artillerie) as manufacturers with a large number of other companies (including some in the UK) as subcontractors. The FT was an unusual but interesting and successful tank in its technical and tactical features. Technically, the tank lacked a conventional chassis but was rather a monocoque of riveted armour plate between 6 and 16 mm (0.24 and 0.63 in) thick, a boxlike structure to which were attached the major internal and external components terminating at the tail in an upswept plate that increased the effective length of the vehicle as an aid to trench crossing, which was 1.35 m (4 ft 5 in) without and 1.8 m (5 ft 11 in) with the tailplate. The hull accommodated the driver at the front, the turret in the centre, and the combined engine and transmission assembly at the rear. The driver gained access to his position via twin frontal doors, and the other crew member, the commander/gunner, used rear doors to enter the turret, which had a maximum thickness of 22 mm (0.87 in). The turret, surmounted at its rear by a mushroom-shaped observation cupola, was the world’s first to offer 360° traverse and rested on a ball race for ease of manual movement until a neat handbrake was used to lock the turret on the desired bearing. The armament in the first machines to enter service was an 8-mm (0.315-in) Hotchkiss machine-gun capable of elevation in an arc between -20° and +35°. Some 4,800 rounds of ammunition were carried. The engine was a 35-hp (26.1-kW) Renault petrol unit, and drove the tracks by means of a crash gearbox, with a clutch-and-brake system used for steering. Suspension of the tracks was achieved by coil and leaf springs for the four bogies (nine road wheels), and at the front of each track was a large idler to provide sufficient track rise for the FT to climb a 0.6-m (2-ft) parapet. The idlers comprised a steel rim over laminated wood centres, and there were six track-return rollers. The first production tanks were completed in September 1917, but the whole programme was hampered by shortages of the special cast steel turret and by arguments within the army about the precise nature of the armament to be fitted. By the end of the year Renault had delivered only 83 examples of the initial variant, which was designated the Char Mitrailleuse Renault FT 17 and first used in combat on 31 May 1918 in the Forêt de Retz. The turret problem proved impossible of solution in the short term, and after the delivery of some pre-production vehicles with cast turret the producers designed their own eight-sided turrets of riveted plate construction, allowing larger-scale production from about the middle of 1918 for the delivery of 3,177 tanks before the Armistice against orders that currently totalled 7,820 including 3,940 from Renault. When the cast turret began to arrive in useful numbers it was installed on a version generally designated FT 18. In 1921 the French army still deployed the FT in substantial quantities: of the total of 3,728 such vehicles 2,100 were armed with a machine-gun, 1,246 with a 37-mm gun and 39 with a 75-mm (2.95-in) gun, while 188 were fitted with wireless equipment and 155 were training tanks. The second FT version to appear was the Char Canon Renault FT 17, in which the turret accommodated a 37-mm Puteaux gun capable of elevation in an arc between -20° and +35°. Ammunition stowage was provided for 200 HE, 25 armour-piercing and 12 shrapnel rounds (237 rounds in all). Production orders for the gun-armed version totalled 1,830 units, and together with the standard model with a machine-gun it was used by countries including Belgium, Brazil, Canada, China, Czechoslovakia, Finland, Greece, Italy (with modification the Fiat 3000), Japan (Type 79 Ko-Gata Sensha), Manchuria, the Netherlands, Poland, Spain, the UK, the USA (6-Ton Tank M1917), the USSR (KS, and with modification MS-1 and MS-2) and Yugoslavia. The other two initial variants were the Char Canon Renault 75S with a short-barrel 75-mm (2.95-in) gun in a riveted heptagonal turret with a bustle to accommodate the gun recoil, and the three-man Char Renault Télégraphie Sans Fil with a boxlike superstructure and tall aerial for the wireless equipment needed in the command role. The variant with the 75-mm (2.95-in) gun was really a self-propelled gun, and though orders were placed for 970 units the type was so delayed that it did not appear until after the Armistice, thereafter being produced only in very small numbers mainly for service in North Africa. The FT was also developed after World War I in a number of largely experimental forms as the Char Fascine (trench-filler with up to three fascines), Char Demineur (mineclearer with two ploughs on hinged forward arms), Char Projecteur (internal-security searchlight vehicle with a tall mast supporting twin searchlights), a smokelaying vehicle, an amphibious vehicle, a bridgelayer, a bulldozer, and a cargo carrier with a largely redesigned hull. The FT was also used as the basis for experimental work with the Citroen-Kegresse suspension and rubber-band track system for higher speeds and quieter running. Trials with these continuous rubber tracks were undertaken in 1924 and 1925, and though much interesting data was collected, nothing came of the system. From 1931 remaining FT 17 and FT 18 vehicles were refitted with the new 7.5-mm (0.295-in) Hotchkiss modèle 31 machine-gun and redesignated Char Mitrailleuse Renault FT 31: this variant’s ammunition stowage was 4,050 rounds including 400 armour-piercing rounds. The FT remained in widespread service between the two world wars, seeing service in Morocco, Syria and Tunisia before meeting its end in the German invasion of France during May and June 1940. Machines captured by the Germans were used for internal security duties with the designation PzKpfw 18R 730(f). It is worth noting that even in the 1920s the French sought to capitalise on the capabilities of the basic FT design by producing an upgraded model as the Char NC 1, otherwise designated the Char NC 27 and intended as an infantry support tank. This was considerably up-armoured from the standard of the FT, with a maximum of 34 mm (1.34 in) on the turret front and 30 mm (1.18 in) on the hull front for a combat weight of 8500 kg (18,730 lb). Power was provided by a 60-hp (44.7-kW) Renault petrol engine for a maximum speed of 18 km/h (11.2 mph), and on each side the suspension comprised three coil-spring columns combined with six hydro-pneumatic shock absorbers for three four-wheel bogies; there was also an independent wheel at the front. Armament was either one machine-gun or one 37-mm gun, and though the type was not adopted by the French army it was exported to Japan as the Otsu-Gata Sensha, and to Yugoslavia. The Char NC 1 was followed by the Char NC 2, otherwise designated the Char NC 31. This was similar to the NC 1 (NC27), but weighed 9500 kg (20,944 lb), was fitted with heavier tracks, was powered by a 75-hp (55.9-kW) Renault petrol engine, and carried an armament of two 7.5-mm (0.295-in) machine-guns. Small sales were made to the Greek army. This was the mainstream of French tank development in World War I, and though a few experimental types were developed these generally failed to lead anywhere. The exception was the Char 1, developed in two forms as a char de rupture (breakthrough tank) for the planned 1919 offensives and most important as the precursor of the Char 2C.